Freed British hostage Norman Kember is returning home - to a row over whether he thanked the soldiers who saved him. 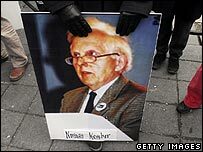 Peace campaigner Mr Kember, 74, of Pinner, London, was kidnapped in Iraq last November. He and two Canadian hostages were rescued on Thursday. Head of the British Army, Gen Sir Mike Jackson, said he was "saddened" there did not seem to be any gratitude. Christian Peacemaker Teams, the group all three men were campaigning for, insisted it had thanked the soldiers. And Pat Kember, the campaigner's wife, said: "I am overjoyed that Norman is free to come home and I am very grateful for all those who have helped secure his release." Mr Kember spent the night in Kuwait, and is due to land at Heathrow Airport in London later. Sir Mike told Channel 4 News on Friday: "I'm slightly saddened that there doesn't seem to be a note of gratitude for the soldiers who risked their lives to save those lives. "I hope he has and I've missed it." But Jonathan Bartley, a UK spokesman for Christian Peacemaker Teams (CPT), told the BBC he was "deeply surprised" and "bewildered" that the soldiers believed they had not been thanked. "It is a matter of public record and has been widely reported that Christian Peacemakers have expressed great gratitude to the soldiers who rescued him." The CPT released a statement on Thursday after the rescue of Mr Kember, James Loney, 41, and Harmeet Singh Sooden, 32, thanking the troops. 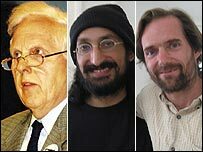 It said: "We are grateful to the soldiers who risked their lives to free Jim, Norman and Harmeet. "As peacemakers who hold firm to our commitment to non-violence, we are also deeply grateful that they fired no shots to free our colleagues." Jan Benvie, also from CPT, told BBC News she intends to go to Iraq in July. She said she did not accept her presence should mean an extra responsibility for the security forces. Mr Kember said he had enjoyed a shave, a bath and a "good English breakfast" since returning to freedom. The two Canadians were due to leave Iraq on Saturday. They were due to arrive in Dubai at 1730 local time before making their way back to Canada, CPT said. The rescue followed a weeks-long operation led by British troops and involving US and Canadian special forces, and information gleaned from two detainees just three hours before the rescue. US citizen Tom Fox, kidnapped at the same time on 26 November in Baghdad, was found shot dead earlier this month. His three colleagues did not find out he was dead until after their release, according to CPT, which also said the men had not been bound during captivity. They were not given much food but Mr Kember had received medicine he needed. Prime Minister Tony Blair, attending an EU summit in Brussels, paid tribute to the "extraordinary courage and dedication" of the British, American, Iraqi and Canadian forces involved in the rescue operation. Foreign Secretary Jack Straw urged people planning to undertake humanitarian work in Iraq to think again, saying there was a real risk of being kidnapped or killed. Between 10 and 40 Iraqis are kidnapped every day - often children snatched on their way to school and held for a ransom of between £3,000 and £30,000.